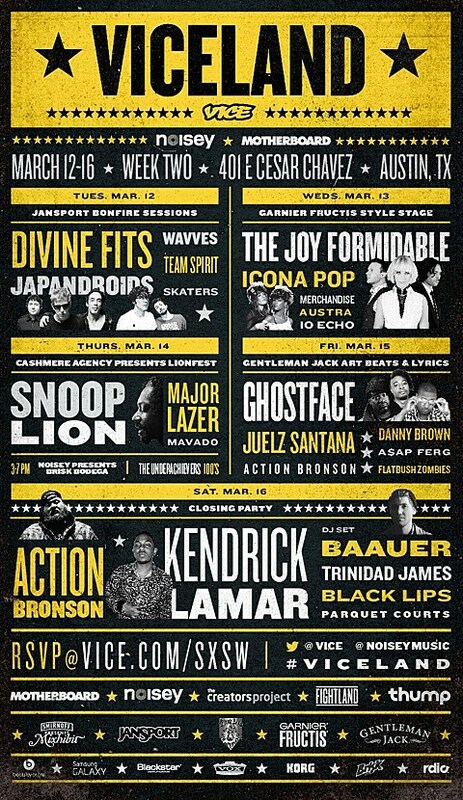 VICE is coming to Austin for SXSW and will be taking over 401 E Cesar Chavez for VICELAND, which includes events from March 8-11 during the interactive portion, and from March 12-16 during the music portion. The music events feature a ton of bands like Kendrick Lamar, Action Bronson, Baauer (DJ), Parquet Courts, Snoop Lion, Major Lazer, Ghostface, Danny Brown, Divine Fits, Japandroids, Wavves, Austra, Merchandise, and many more. RSVP is open.